The Bachelorette alum Robby Hayes is setting the record straight when it comes to rumors he's dating Are You The One? participant Kathryn Palmer. "We enjoy getting to know each other and have fun hanging out," Hayes, 28, told Us Weekly. "She's a super sweet girl, but there's nothing too serious going on. We're definitely not dating." Palmer sparked dating rumors earlier this month when she posted a couple of cute photos on Instagram of the pair spending time together. On April 7, the MTV star shared a picture in which she and Hayes had their arms wrapped around each other. And about one week later, Palmer posted a photo of the couple smiling and posing together in front of an elephant at Florida's Jacksonville Zoo, writing, "Should we talk about the elephant in the room?" One of the reasons Hayes -- a Jacksonville, FL, native who says he's single right now -- is apparently pushing back on the relationship is because he's been considering a stint on Season 4 of Bachelor in Paradise this summer. "She knows that's in the cards for me," Hayes, a model and former competitive swimmer, told Us. "If that happens, we don't want any drama between us." The Florida State alums -- he graduated in 2011 while she reportedly started in 2012 -- were introduced by Palmer's mother and a mutual friend who has a connection with Hayes' sister. Hayes told Us that he invited Palmer to hang out with him when he was working an event in Fort Lauderdale. "We have a mutual knowledge of reality TV, so it's fun to talk to her about that and share our experiences. We're Florida born and raised, so we have a lot in common," Hayes explained. 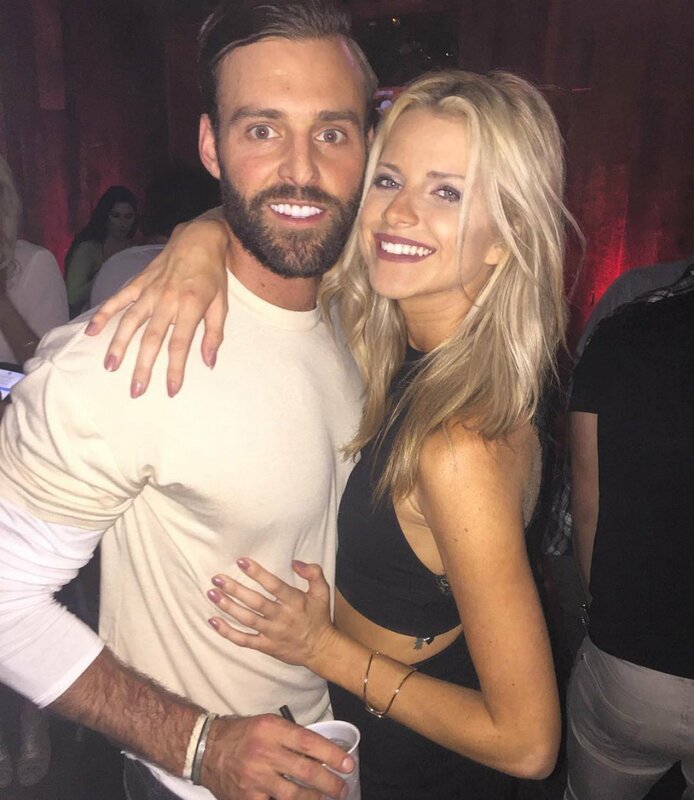 Even if Bachelor in Paradise doesn't turn out to be an option for Hayes, however, long distance may present an issue for this potential romance. Hayes just recently moved into former The Bachelorette winner Jef Holm's Venice, CA, home with his best buddy Chase McNary. Both Hayes and McNary had competed for JoJo Fletcher's heart on The Bachelorette's twelfth season last year. (Hayes finished as the runner-up). Holm proposed to Emily Maynard on Season 8 of the series but the couple called it quits shortly after the finale aired on ABC. Palmer, who recently appeared on the fifth season of Are You The One?, currently resides in Tallahassee, but according to Hayes, that could change in the near future. "She wants to move out to L.A. and that was something she wanted to do before I met her," Hayes told the magazine. "She wants to get a house out here with [Shannon Duffy] and [Carolina Duarte] from her show, which I encouraged. I'd love to hang out with her here. If it happens, it happens. If it doesn't, it doesn't."